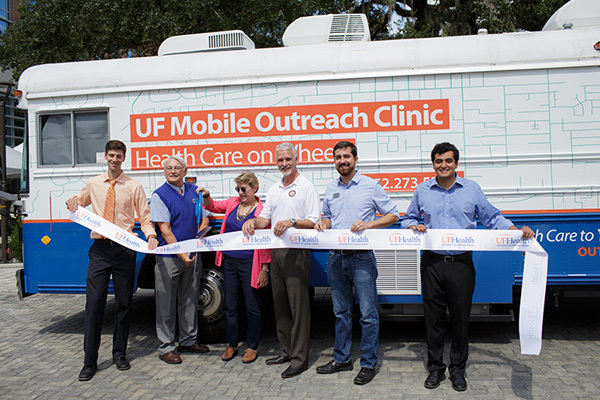 The renovated UF Mobile Outreach Clinic bus was dedicated by, from left to right: Grant Harrell, M.D. ; Joseph Fantone, M.D. ; Nancy Hardt, M.D. ; State Sen. Keith Perry; Gainesville commissioners Adrian Hayes-Santos and David Arreola. The vehicle has had a major makeover, but the mission remains the same. On Sept. 27, the UF Mobile Outreach Clinic unveiled its newly renovated bus to students, faculty and staff at the UF College of Medicine and the rolling clinic is back bringing health care to the community. For nearly eight years, the Mobile Outreach Clinic, or MOC, has helped deliver health care to medically underserved people in low-income neighborhoods and rural areas in and around Alachua County while giving UF undergraduate medical, physician assistant and other health professions students with a valuable educational experience. Last year, the MOC provided health care to more than 4,000 individuals including acute care visits, preventive health screenings, sports physicals and chronic disease management, said Grant Harrell, M.D., medical director of the MOC. Staffers, residents, faculty from various UF departments and volunteer physicians from the community all work with the students on the bus. “This community-university partnership is a model of how we can leverage resources to care for our community and fellow citizens,” Harrell said. 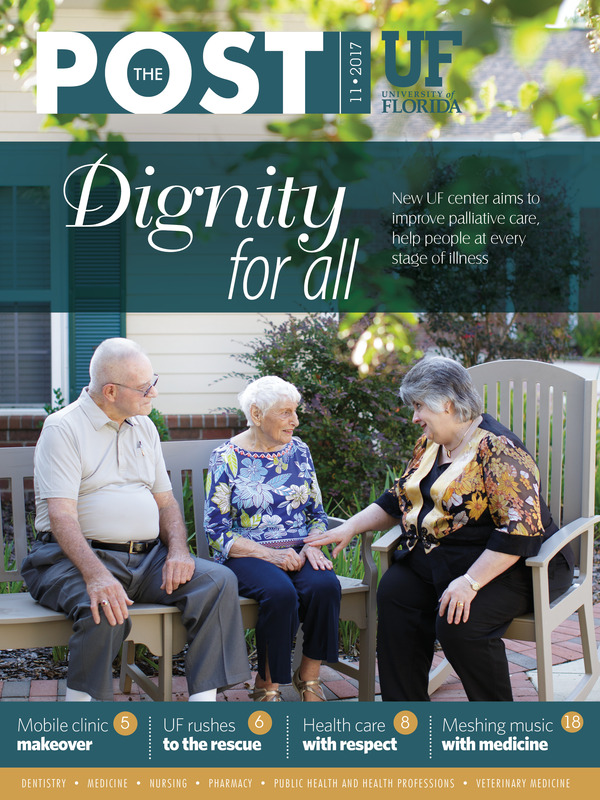 The clinic transitioned from women’s health to community health care in 2010, said Joseph C. Fantone, M.D., senior associate dean for educational affairs in the UF College of Medicine, adding that the MOC would not be possible without the vision of professor emeritus Nancy Hardt, M.D. Along with providing needed health care to underserved populations, the MOC’s goal is to educate students in fields such as medicine, pharmacy and dentistry. Fantone said the MOC also teaches students the value of access, as many of the clinic’s patients are unable to find transportation to a doctor. “When students are out in the community, they experience the challenges these patients go through every day,” he said. Fourth-year medical student De-Vaughn Williams began volunteering with the MOC eight years ago during his first semester at UF . He was introduced to the clinic by Hardt and has been with the team ever since. Williams said by volunteering on the bus, he has developed greater compassion and empathy for patients. He said he also gained confidence in his clinical skills.